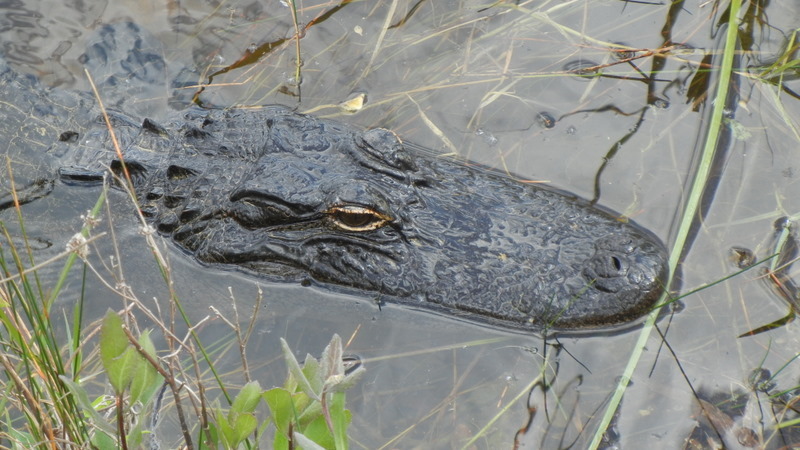 Our 6" Aligator Tonight we are camped at Gator Park in the Everglades about 6 miles east of Miami. Since this is a holiday weekend it was hard to find a campsite. I called about 4 RV Parks and they were all booked up, didn't answer the phone, or told me they only accept 40 ft Class A motorhomes and ours doesn't qualify. Too bad; I'll bet they don't have 6 ft alligators a few feet from their campsites. I like the alligators better than (most of) the folks with the 40 footers. For the past 2 days we had some fun times with Great Loopers Greg and Susan, Phil and Alice, and, Tom and Linda. We had dinner Friday at the Key BiscayneYacht Club and Saturday at Greg & Susan's. We feasted on a fresh caught mahi-mahi we bought at the Green Market in Key Biscayne. Mavis and Susan toured the Quiet Garden at Crandon Park. It wasn't very quiet with peacocks and sandhill cranes (Click here to hear the racket). Tom and Linda had just arrived that afternoon on their 42 ft boat from Nassau. Their trip took 33 hours with only 5 hours of sleep at anchor on the way. Tomorrow we cross to the west coast of Florida and start to work our way north.